As I wrote my post about the new Facebook News Feed today, one of my concerns was over the Ticker and privacy. It’s not that your privacy settings are changed in any way. It’s that Facebook now surfaces some things that you didn’t previously think about. Be careful of what you post on my wall. My friends can see it. These things were always available before. If a friend went to your profile, there was an update there for these items. It’s just that people don’t regularly go to profiles to see that information. So most of us didn’t think much about it. But now it’s there in plain view. When you write on someone else’s wall, all of your friends know. You control privacy of your own wall, status and other updates. When you post on someone else’s wall or comment on someone else’s update, your privacy is at their mercy. 1) You write a status update, you control who sees it. 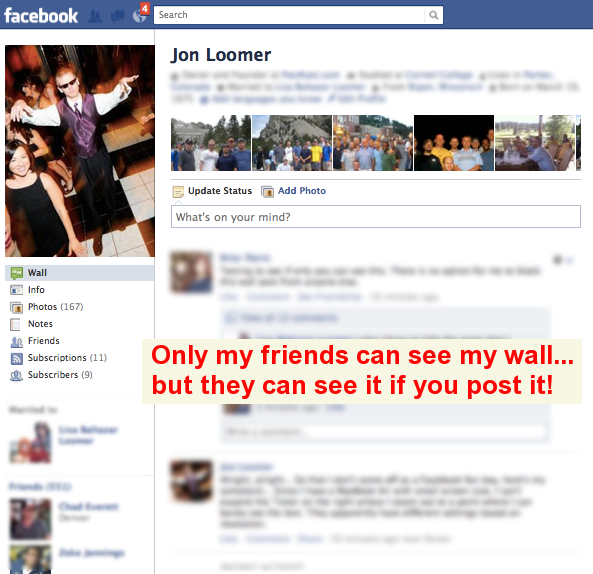 2) You write on someone else’s wall, the people who can see that are subject to the wall-owner’s privacy settings. It could be all of their friends. It could be completely public. 3) You comment on someone’s update, the people who see that are subject to the poster’s privacy settings. Feel comfortable posting your own updates. You control the audience. But be careful whenever posting on someone else’s update or wall. Post as if anyone can see that info.